Fine wine is often associated with European culture, but as the Black Cellar Club will tell you, the decolonisation of the industry in SA is at hand without the need for anyone falling. The South African wine industry is one of the most celebrated in the world with top cultivars and blends often making it onto the international arena and fetching outstanding prizes and awards. Yet for the most part, enjoying a cultured wine experience has been something unfamiliar for many black South Africans. This is about to change. In fact—it has already changed…The Black Cellar Club (BLACC) was recently founded and launched by bespoke representation company Vula Afrika and seeks to empower, educate and inspire South Africans who have previously been excluded from the wine industry to become active in the arena and bring about transformation in this lucrative and vibrant market. BBQ spoke to BLACC executive board member and Vula Afrika director, Aubrey Ngcungama, about the initiative’s exciting aspiration to inject new blood into the wine industry and what it will mean for black South Africans in the long run. Ngcungama initiates the discussion with a peak into his own journey travelled to where he is today heading up the initiative with his fellow team members. I’m a proudly Zulu boy, hailing from that most beautiful province—KwaZulu-Natal. I was also adopted by a British family so I have enjoyed the best of both worlds. I was educated at Michaelhouse and did two stints at Essex University and UCT. It turns out I’m not really into the whole classroom story but the ‘university of life’ has been most interesting. Over the years I have worked in hospitality, have been an MC, served on several boards and also enjoyed performing as an amateur opera singer. It’s been a life of many facets. I’m shaped by my deep love for South Africa and people. This I’m sure I inherited from my family,” Ngcungama says.Ngcungama is however not new to good food and wine and has been privileged to have enjoyed top-notch exposure which has shaped and refined his palate considerably. This was a gift bestowed to him by his family. Ngcungama’s father was a hotelier, which meant that food and cooking has been integral to his upbringing for most of his life. “He instilled in me the passion and intrigue for all things culinary. Wine came later as I grew older and developed my palate.” From a reasonably early age, Ngcungama was encouraged to taste wine by his father, “just tasting of course”. This has been a long and greatly satisfying journey according to him. If you have heard of the popular dining and cuisine show Come Dine With Me, you might find it interesting to learn that Ngcungama’s cooking skill has graced our television screens. Till today, he refers to it as “an amazing experience that has created everlasting friendships with my fellow contestants.” His culinary skills also comes from eating good food, he confesses. “The love for cooking stems from the love for eating good food. Those are my happy habits. I spent a lot of time honing my skills in the kitchens of our family restaurants in the UK and also countless hours under the watchful eye of my late father. Lately, I enjoy cooking for friends in their own kitchens. It’s all about Sunday lunches and changing the world around the table, and lots of good wine,” he says.Besides his love for good food and dining, Ngcungama has also been brand ambassador at the One&Only hotel in Cape Town for four years. During this time he says his love for people could truly manifest itself since he was constantly interacting with guests from all over the world. “Every guest is a VIP at the One&Only. I remember fondly being introduced to Mr Kofi Anan by a local university rector as ‘the trouble maker from Come Dine With Me’—he had a good chuckle and was interested to know more. A frequent occurrence,” he says. Heading up one of South Africa’s dynamic and flourishing bespoke representation companies, Vula Afrika, Ngcungama says they are extremely proud of what they are achieving today, both in terms of BLACC and the activity at Vula Afrika. “We are extremely proud of the way BLACC is flourishing. So many extraordinary stories of human triumph in a typically Western profession. Vula Afrika is a brainchild of Ian Manley and myself. We are joined at the hip by our business partner Julie Killias. We’re also in the business of opening doors, so we keep a very large database which helps us reach people who are otherwise impossible to reach because of their high profile. We have ambitions beyond the South African borders. Africa is a magical place and so much connecting is awaiting business both here and on the rest of continent,” Ngcungama says. BLACC was another independent brainchild of both Manley and Ngcungama and was launched in October last year. 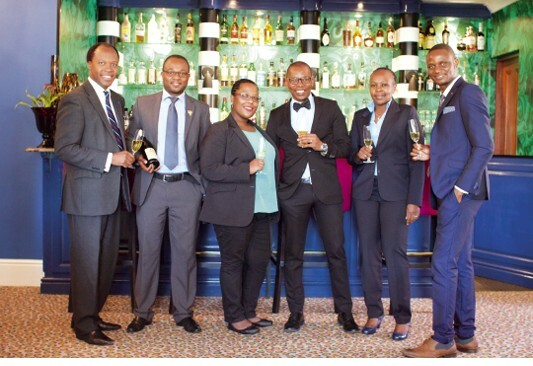 Essentially, Ngcungama says, they both recognized that there was something special happening in South Africa amongst black sommeliers. “They were literally at the helm of all the top hotels and restaurants.” This he says was something which had to be formalized and in so doing, would encourage more black people to drink “our great South African wines”. This initiative also has the purpose to educate, empower and open doors according to him. 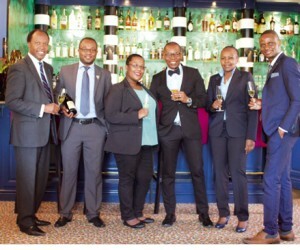 It has been extremely well received by both consumers, winemakers and professionals in the hospitality industry, as well as the media Ngcungama says. “Wine has not traditionally been a major beverage of choice among black Africans. It has for a long time been perceived as a European drink and one for snobs.“This is changing rapidly and the market has opened up with new, affluent consumers ready to dig in. However, the perception is largely that foreign luxury brands are the best. We’re trying to change this because South Africa produces some of the very best wines and spirits in the world. We need to enjoy them responsibly, and supporting our local producers needs to be prioritised. BLACC seeks to do just that. And we must win!” he exclaims.Empowering black South Africans to be active in the wine industry is however about more than mere exposure. Looking at the goals of the educational initiatives BLACC offers we also find responsible drinking on the list. “As we all know, alcohol is an addictive substance when consumed irresponsibly.” He says as the club grows, they will be taking on the education mantle vigorously since it is important for both their members and society at large to be aware of dangers of not using the beverage responsibly. So in terms of transformation and equal representation in the market, how far do we still have to go? According to Ngcungama, we have a long way to go in South Africa when looking at black representation in the production of wine and the market beyond. “It’s purely historical and as the taste for good wine grows, so I believe will the appetite for producing it. It is a very difficult occupation, as all farming is. It’s a long road ahead but initiatives like BLACC are breaking the mould one grape at a time.“I believe that the few black producers who are out there are doing a great job but they find it very difficult as they are so few. We need to support them just as much as the industry at large. BLACC seeks to bring more of them into the business by encouraging people to venture into wine at all. We are keen to learn from all our colleagues in the industry and will partner with like-minded organizations as we develop.